Sometimes I wonder how tall it would be, the stack of books I want to read. My virtual shelf has 164 titles waiting, books others recommend and I want to remember. I will get to them one day. My Amazon wish list, which does not overlap, consists of more than 50 books I'd like to own so I can savor them without the limitations of my library's lending policy. These are the ones I want to fill with handwritten notes and highlights, and dog-ear the pages to my heart's content. It would be - and it has been - easy to get lost in the 200 books before me. The longer they've been on my list, the further they get pushed down on it. I grab books on a whim, with no clear plan. I find myself in the middle of too many books at once, never giving one the full attention it deserves. This year, I've determined to change that with a monthly reading plan. I've made a list for the first six months, to keep my wandering mind on track and to hold myself accountable. Each month, I will read three books: one fiction, one biography/memoir, and one for spiritual growth. I may - and most likely will - read more, but I will finish the books on my list before moving on. ~Fiction: The Chosen, the story of two Jewish teenage boys during the 1940s, one chosen by his father to be a rabbi and the other who has chosen himself to be a rabbi. Intense, thought-provoking, and educational. ~Biography/Memoir: Life Together: The Classic Exploration of Faith in Community. My first reading of Bonhoeffer. Encouraging and convicting, this book has given me a new appreciation for my church family. ~Spiritual Growth: Made to Crave: Satisfying Your Deepest Desire with God, Not Food. My small attempt at a review can be found here. ~Not on the list: The Heart Mender: A Story of Second Chances. Andrews says the premise of the story is true, as unbelievable as it seems. This book provided much conversation during our recent journey home. ~Fiction: Amy Inspired, because author Bethany Pierce inspires me with her honest writing. ~Biography/Memoir: Walking with Lincoln: Spiritual Strength from America's Favorite President, in honor of his birthday. ~Spiritual Growth: Margin: Restoring Emotional, Physical, Financial, and Time Reserves to Overloaded Lives, because I need this more than I can say. 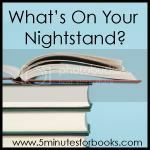 Other readers are sharing what's on their nightstands at 5 Minutes for Books. The Chosen looks very intriguing. Thanks for sharing your list, Melissa! That sounds like a good plan and a good way to keep balanced. I don't think I have heard of any of these titles except Made to Crave. Margin definitely sounds interesting. I'm sure you'll have some interesting things to share from that. I wonder how many books I would find awaiting my attention if I sat down and attempt to give a number guesstimate. I don't think I want to know. But the number is likely somewhere around 200. Scary, huh? So many books, so little time. Must make wise choices! Good idea to schedule them like this! That way, they'll get read - AND you'll probably read many more to boot! My "to be read" list is getting longer every week! I love your plan!! I have a handful of books on my shelf that I want to get to this year, in the midst of review titles. I also plan to read more Christian living/teaching books this year as well. The Chosen is on my list of to-read books; I've heard it is a good one! Never heard of any of those books. I do like to read and will be checking these books out. All of Bonhoeffer's books are on my TBR list. I really want to read the biography of him by Eric Mataxas. I've also heard great things about Made to Crave! How wise you are! I can so relate to everything you said about your lists. Sigh. If I had nothing but time to read, I still don't think it'd be possible to read every title I've saved somewhere as a possibility. Nonetheless, you're making a dent in a positive way. Bravo. I read The Chosen a few years back; good food for thought. And The Heart Mender--my husband actually read it too and liked it enough to encourage our daughter to read it.